Neither the Lady Bulldogs nor the Cavegirls of Class 6A Carlsbad were generating much in the way of offense in the first half Tuesday at Bulldog Pit. The Artesia girls managed just a trio of buckets in the opening quarters but Carlsbad managed only three more as the teams struggled through 17- and 21-percent shooting from the field respectively. As such, despite the slow start, the Lady ‘Dogs trailed the girls in blue by just seven points at the break, 16-9, giving them a chance to turn things around in the second half. 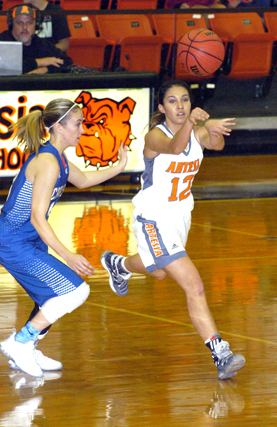 But while the Cavegirls finally located their rhythm, particularly from beyond the arc, Artesia was unable to keep pace, and the result was a 45-24 defeat that drops the Lady Bulldogs to 5-2 on the year. The Lady ‘Dogs tumbled into a 7-0 hole early, scoring their first basket with 3:19 to go in the first quarter on a steal under the basket by Paityn Houghtaling. But although Artesia managed just one other shot from the field in the period – an Elisa Cardenas trey with just under two minutes to go – they were down by just three, 9-6, going into the second against a Cavegirl team that led them by 17 in the opening half of the teams’ City of Champions Classic title bout Dec. 11. Laci Taylor provided another longball for Artesia midway through the second quarter to make it a two-point game, 11-9, but Carlsbad was able to close out the half with five unanswered points – three from the stripe – to lead 16-9. Cavegirl Mariel Gomez came out firing to start the third, draining a pair of three’s, but a trey by Alexa Riggs and a Kyrah Gonzales jumper kept the Lady ‘Dogs in the mix at the halfway point, 23-14. The girls in blue would rattle off nine unanswered to close out the quarter, however, and quickly bump their advantage to eight, 32-14. And by the time Artesia posted its first points of the final eight minutes with 3:02 remaining in the game, Carlsbad had put it out of reach, going up 45-14 before Houghtaling powered one in from the paint. Gonzales and Riggs notched three’s and Gracie Puentes a pair from the line in the final moments to set the final, 45-24. “We just come out a little flat in the third quarter and they crept away from us,” Coach Houghtaling said. “I don’t feel like they just jumped us and really kicked our tail – it was just a gradual thing over the course of the third quarter and the first half of the fourth because we weren’t hitting any shots to stay with them. The Lady ‘Dogs shot 23 percent from the field on the night to Carlsbad’s 29. Of the Cavegirls’ 17 field goals, seven came via offensive boards and three on steals. Riggs led Artesia with six points in the contest, followed by Gonzales with five and Houghtaling with four. Carsyn Boswell had 18 for Carlsbad. The Lady Bulldogs will now have an eight-day break before heading to Alamogordo Dec. 29-31 for the Holiday Classic tournament. 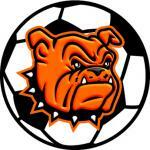 Artesia is set to open at 1 p.m. Dec. 29 against Cobre. “The girls are going to have a few days off here, and it’ll be nice to get away from the gym for a few days, but we’ll be back at it next Monday,” said Houghtaling. “We’re going to be doing a lot of shooting, a lot of basic stuff, fundamental stuff, next week, and all that in preparation for the Alamogordo tournament.